This re-issue of The Damned: Three Dead Men gets The Sixth Gun band back together again for a hellacious, high-octane romp through Prohibition-era America. At Broken Frontier, we’ve been huge boosters of Cullen Bunn for several years now. A former columnist for the site and a contributor to the Broken Frontier Anthology, Bunn has long since moved on to a critically-acclaimed career as a writer, who produces a massive number of comics each month for a wide variety of publishers. To say he is prolific would be a gross understatement. Although he’s written a variety of titles for both Marvel and DC, it is his creator-owned work we love best. One of his most popular series is The Sixth Gun, an epic horror-western genre mash-up that spawned countless imitators thanks to its strong narrative voice, breakneck pace, and gorgeous art. Bunn’s collaborators on that series, artist Brian Hurtt and colourist Bill Crabtree, were an integral part of the series’ popularity; their slick, accessible art luring readers into a world of devilish Civil War generals and Hell-marked pistols. 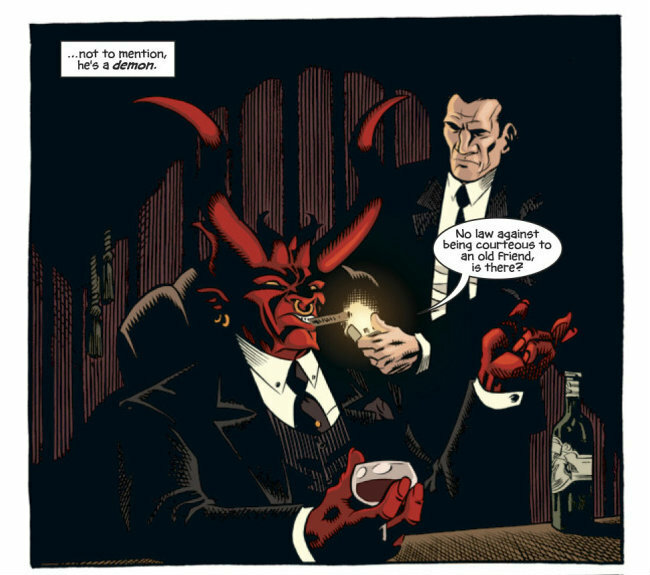 Prior to their collaboration on The Sixth Gun, Bunn and Hurtt created The Damned, a Prohibition-era mob story about an undead gangster named Eddie, who works for (and often around) a demonic crime family run by arch-demon Al Aligheri. Originally published in 2006 by Oni Press, the five-issue limited series was recently re-mastered in preparation for a new ongoing series debuting in May, with Bill Crabtree’s atmospheric colours lending an added layer of depth to Hurtt’s wonderfully stark black-and-white art. So let’s whet your appetite for the new series by revisiting the past. 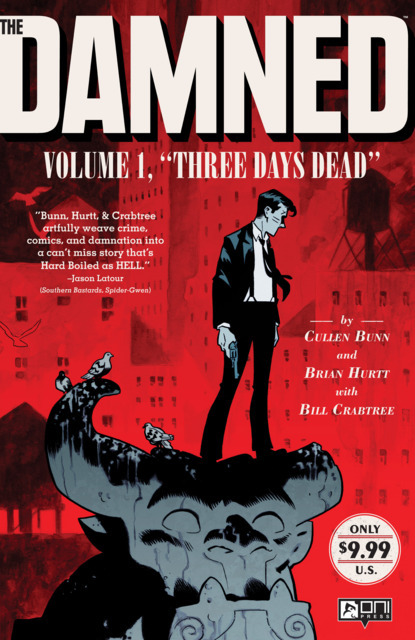 Here are three damn fine reasons you need to read The Damned: Three Days Dead. I’ve always felt the Prohibition era was somewhat ironically named. Of course, looking back from several decades in the future, it’s easy to make such a determination but for a period that outlawed the sale and consumption of alcohol, there sure were a lot of shenanigans going on. In fact, all Prohibition really did was push recreational drinking and associated activities such as prostitution and drug abuse underground, lining the pockets of a burgeoning criminal underworld in the process. As with The Sixth Gun, Bunn creates a strong narrative voice for the series, this time through the first person narration of Eddie, who looks and sounds like he stepped out of an old gangster flick. Everything from the snappy patter of the book’s movers and shakers to the serpentine mystery at the centre of the plot evokes the noir sensibilities and hardboiled tone of classic crime fiction. 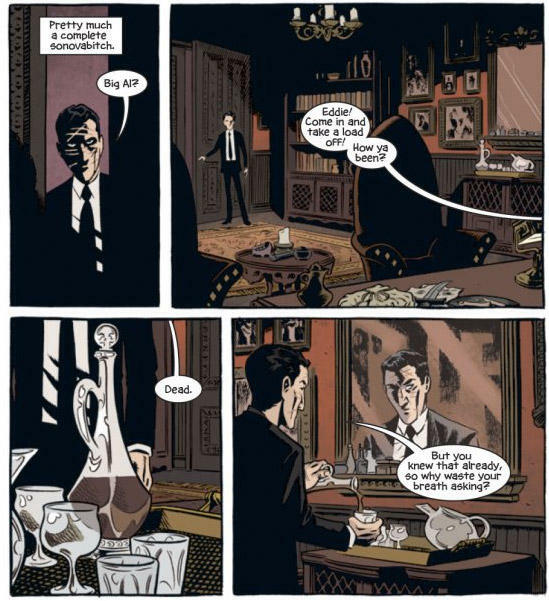 Under Bunn and Hurtt’s artistic guidance, The Damned transports readers to another time and place, celebrating an exciting era of fiction and history that continues to resonate with audiences almost 100 years later. Originally published in black-and-white, The Damned has always been a series that was begging for a touch of colour. Don’t get me wrong. I love Hurtt’s original line art. His spotting of the blacks is textured and meticulous; his visual storytelling clear and fluid. 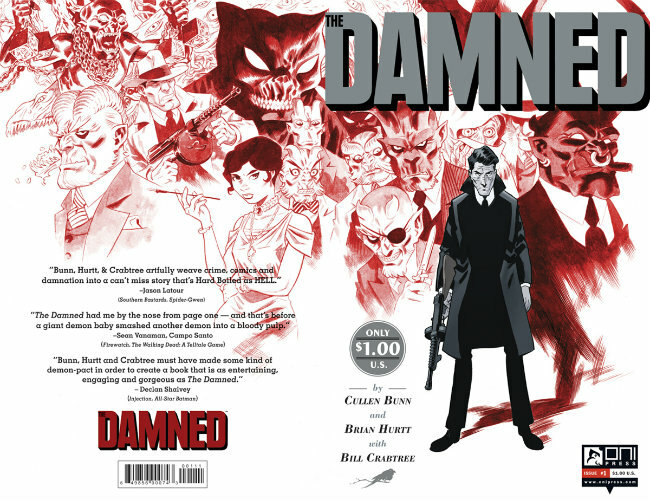 But The Damned is a book about cursed mobsters and demonic crime families from the pit of Hell. A dash of colour only adds to the series’ sinister atmosphere of blood-soaked mystery. Bill Crabtree’s subtle approach to the colour art pays off in spades, here. His palette is dictated by the needs of the story and never substitutes spectacle for substance. Subdued purples and blues add visual depth to Hurtt’s linework while enhancing the shifting emotional tone of the series. Meanwhile, lurid reds and oranges punctuate scenes of a more visceral nature, without ever feeling too garish or gory. 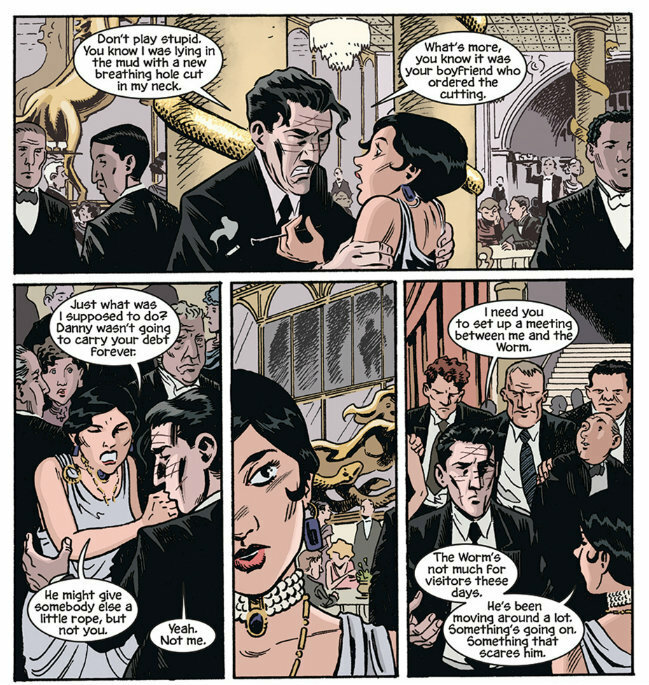 According to Bunn, he’s “writing the first arc of the new series in such a way that it sets up everything and establishes the rules of the world for those who haven’t read the book before.” That being said, it pays to read Three Days Dead, if only to introduce yourself to Eddie before he comes to run his new club the Gehenna Room. Debuting in May from Oni Press, The Damned ongoing series chronicles the next chapter in Eddie’s saga. The series’ opening arc sees an old buddy hit him up for a place to lie low, a sure sign of interesting times ahead for the undying former gangster. Dragged back into a literal criminal underworld, where the princes of Hell rule, Eddie once again must navigate their shifting alliances and demonic machinations if he hopes to avoid dying…too much. But don’t take our word for it. Check it out your own damned selves May 3rd. We can’t think of a better way—or a more damnable one—to celebrate spring than with a new trek through the gates of Hell. The Damned: Three Days Dead is available now from Oni Press. The ongoing series debuts May 3rd.